One of the most famous and beloved mysteries from The Queen of Suspense—Agatha Christie—now a Lifetime TV movie. “Ten . . .” Ten strangers are lured to an isolated island mansion off the Devon coast by a mysterious “U. N. Owen.” “Nine . . .” At dinner a recorded message accuses each of them in turn of having a guilty secret, and by the end of the night one of the guests is dead. “Eight . . .” Stranded by a violent storm, and haunted by a nursery rhyme counting down one by one . . . as one by one . . . they begin to die. “Seven . . .” Which among them is the killer and will any of them survive? 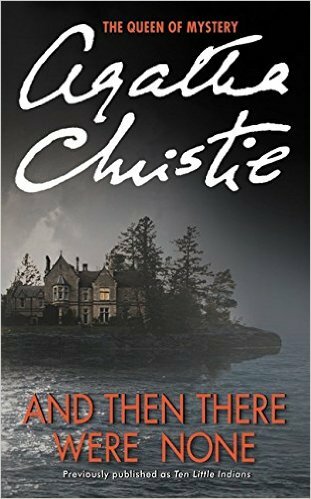 And Then There Were None, the title, of this murder mystery, reminds the reader of fear and death. Ten people are invited to an island and none of them know each other and one among them is a murder who wants them all dead. A storm comes to the island leaving them all trapped with the killer, but which one is he. This story is a murder story so is does go into a little bit depth on how the people died. There are suicides in this book. The moral is focused on the fact that it might be alright if you kill some one to have true justice. There is also some drinking and language in the book. There is also a morbid tone throughout the book. I did enjoy it over all and it is still one of my favorite Agatha Christie books.